Did the EU’s economic recession lead to a rise in populism? Populism in the European Union is higher than it has been at any time in the past 30 years. Populists typically claim that they are the voice of the forgotten. They promise radical change away from the existing establishment. While populism can be of the left or the right, some observers claim that because the traditional left has been occupied with gender, minority rights, diversity, and multiculturalism, the populist right has been able to garner strong support among the low-income wage earners. A recent Bloomberg analysis of radical-right populist parties in 22 European countries showed that, on average, these parties won 16 percent of the vote in the most recent parliamentary election in each country, up from 11 percent a decade earlier and 5 percent in 1997. Are there economic drivers behind this wave? The latest World Bank EU Regular Economic Report points to a possible candidate: Growth is back on track in the EU, but it is less inclusive than before the 2008 crisis, both in terms of convergence between countries and convergence within countries. Before the crisis, it would have taken 30 years for EU countries to have a similar income per capita. Now, convergence between countries would take seven times longer. Convergence within countries is also slowing down. Before the 2008 crisis, growth benefited the lower incomes in the member states more than after the crisis. Poverty in EU member states increased significantly during the crisis. And despite GDP per capita increasing steadily since 2009, poverty kept worsening until 2013 (Figure 1). 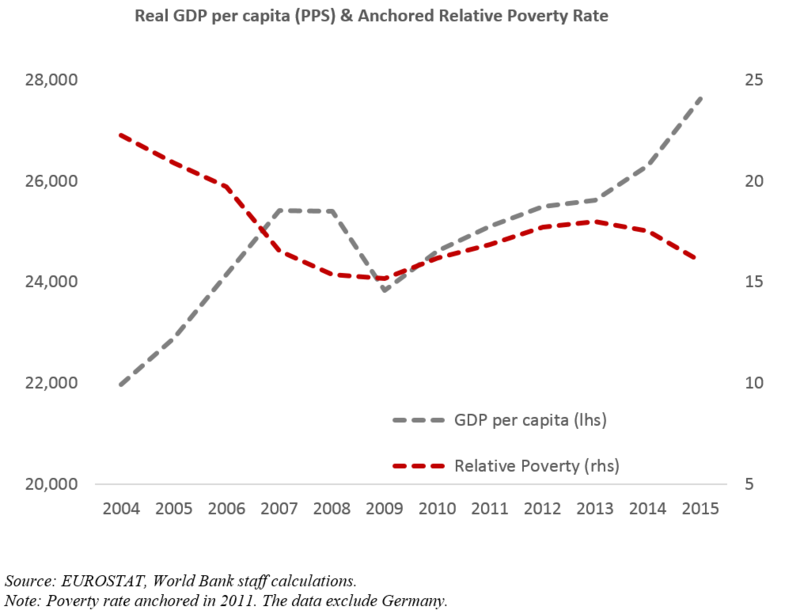 Even by 2015, poverty had not yet been brought down to the pre-crisis level, while GDP per capita had already fully recovered by 2011. After the crisis, the bottom 40 percent of the population saw its income share fall. Inequality increased. In Southern Europe, things look particularly bleak. Out of the 89 million EU citizens who are poor in relative terms, 37 million are in Southern Europe. Even by 2015, Southern Europe had recovered only three-fourths of the GDP per capita lost during the crisis and less than one-tenth of the poverty increase. The income share of the bottom 40 percent of the population fell gradually from 20 percent in 2007 to 19.1 percent by 2015. First, many workers have become part-time workers not by choice. Today, the number of part-time workers is particularly high in Western and Southern Europe, where it now constitutes 27 and 21 percent of total employment, respectively. Many of these workers are involuntary part-time workers—they would prefer a full-time job for greater protection. For instance, in Southern Europe, over 60 percent of all part-time workers are unwillingly part-time. Second, rapid technological change is polarizing the labor market. Workers in automatable jobs are being displaced to below-average earnings positions in the service sector. At the same time, there is an increase in one of the largest and highest income occupational groups: professionals. Third, workers in Southern Europe and, until recently, in Central Europe are receiving a decreasing share of income since 2012. Is this due to a weakening of workers’ bargaining power, caused by the presence of large numbers of discouraged and underemployed workers who would rather increase hours worked than bargain for higher wages? Fourth and fifth, EU populations are aging and overall productivity growth is weak. Aging has contributed to the share of working age population in total population decreasing from 67 percent in 2008 to 65 percent in 2016, equivalent to 9.2 million less workers. The fall in the share of the active population decreases total labor earnings, and thus labor earnings per capita. And finally, most of the EU is experiencing weak overall productivity growth, a driver of total income. To counter-act populism, policymakers should take advantage of the EU’s economic recovery and speed-up policy reforms that would make growth more inclusive, both between countries and within countries. For instance, more, and faster, policy action is needed on the European Pillar of Social Rights. However, the pace of structural reforms in the EU is actually slowing down. A key area is labor market reform. On the one hand, policy should continue to promote flexibility to support job creation. On the other hand, policy should avoid sustained and entrenched duality between temporary and permanent workers. Denmark could provide an example to follow: The hiring and separation rates in Denmark are high, but so is the importance of an activating labor market policy as part of the “flexicurity” framework.